I’m getting quite sad as I realized that after today there’s only 3 more days left to the 24 Days of Tea advent calendar! 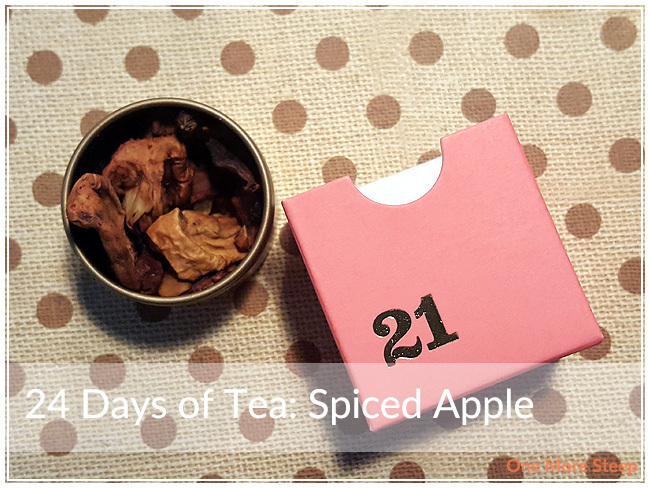 It’s day 21 and the tea today is Spiced Apple, which is another fruit infusion. The first thing that I noticed when I opened the tin was the smell of cinnamon and star anise. I couldn’t really make out the apple, even though I could see visible pieces of dried apple in there. Spiced Apple consists of: apple pieces, figs, cinnamon, star anise, chicory, cardamom, cloves, black pepper, natural apple and spice flavouring. For this fruit infusion, DavidsTea recommends steeping Spiced Apple in near-boiling water (90-95°C/194-203°F) for 4 to 7 minutes. I did my cup (and I wound up using the whole tin) for about 5 minutes. While Spiced Apple was steeping, I could smell cinnamon and star anise on the forefront, with apple playing second fiddle. It steeps to a beautiful golden brown though, it’s very inviting. 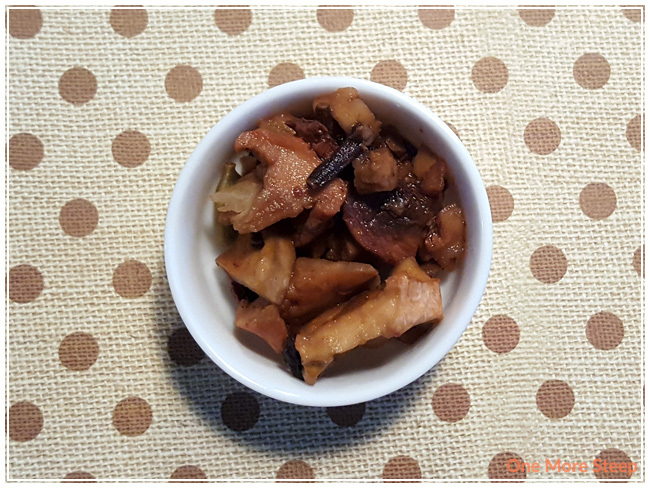 I found that the spices to overwhelm the apple flavour a lot. I was expecting it to be a touch sweeter, given that there is fruit in it and fruit infusions tend towards the sweet side. 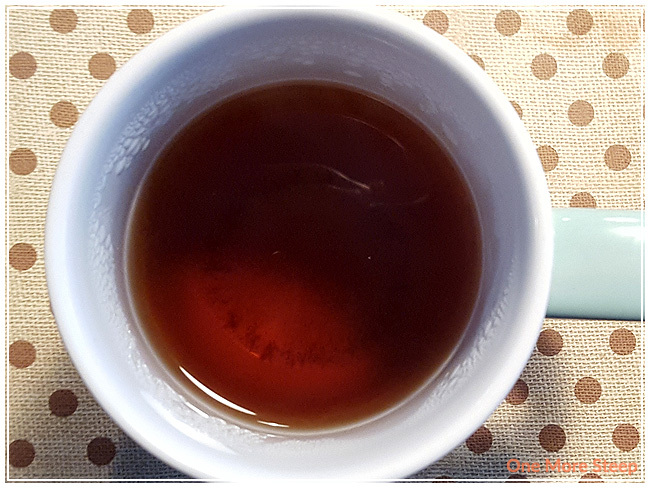 I find Spiced Apple to be rather sour, and I wound up adding some sugar to it and it helped immensely with tempering the sourness of the tea. This one has the spices that I was looking for in Apple Cider, but Apple Cider had more of a punch when it came to the apple flavour. I don’t resteep fruit or herbal infusions. 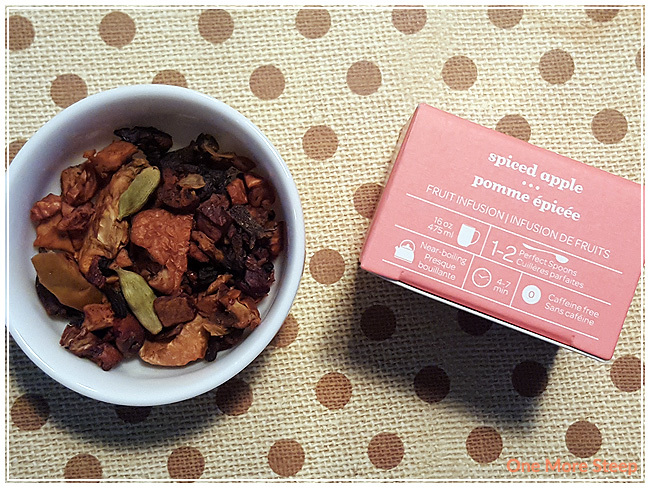 I thought that DavidsTea’s Spiced Apple was just okay. With a name like Spiced Apple, I really did expect the apple and the spices to balance well together, but sadly I was left a little lacking with my cup of mostly spices and minimal apple flavour. I think this tea would benefit from more apple flavouring (perhaps steeping it with a mix of water and apple juice to add a punch of apple flavour in there? ), but as it stands as a straight tea, it is a bit disappointing. The spices, oh the delicious spices, are very much present and very much appreciated. I think perhaps a mix of Spiced Apple and Apple Cider would probably taste quite good as each one brings something to the table that the other lacks. Unfortunately, I used my entire little tin of Spiced Apple for this cup, so I’m unable to try the two together.